Country, blues, soul, and rock 'n' roll. Lonnie Mack mixed ‘em all up in one big roots music bowl and cooked up some of the fieriest licks imaginable on his Gibson Flying V guitar, which he pumped through a Leslie speaker and a Magnatone amplifier. He was also as passionate a blue-eyed soul singer as existed on the planet. Born Lonnie McIntosh in rural Harrison, Indiana (not far from Cincinnati) on July 18, 1941, he was named after hillbilly harpist Lonnie Glosson. His parents played fretted instruments, and he got his feet wet on guitar at six. "My mother taught me chords," says Mack. "It was a musical family." Starting out on a $9.95 Lone Ranger model, Lonnie sang and played with his brother Alvin and two sisters, digging country and R&B equally. "When Elvis and all of that hit, and Chuck Berry and them guys, we was doing all of that," he says. Lonnie bought his Flying V from Cincy music shop owner Glen Hughes in 1958 after Hughes obtained blueprints of the futuristic axe from the Gibson plant in Kalamazoo. "I went in and talked to him, and he showed it to me. And I said, ‘Well, I want one!’ I got one of the first ones," says Mack. "It plays great, and it was the weirdest guitar around at the time." Lonnie shortened his surname to Mack at the suggestion of an Ohio club owner. Mack saw Ohio Untouchables guitarist Robert Ward playing through a Magnatone and knew it was what he’d been searching for. "He had a big influence on me," says Lonnie. "I heard Magnatone amps through him, and I had to get me a Magnatone." 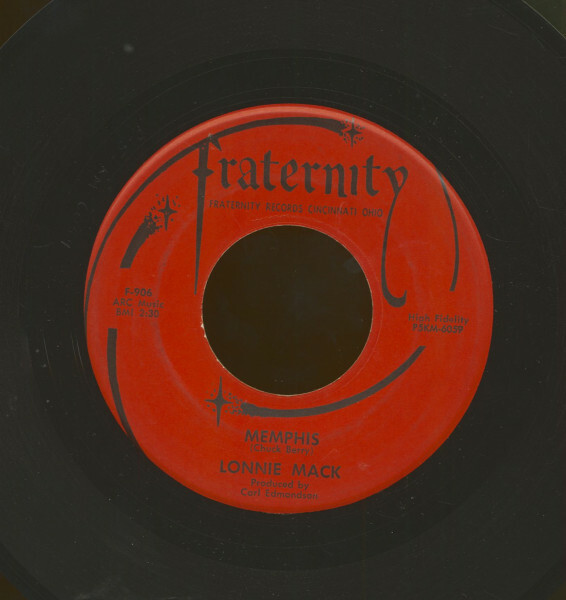 Harry Carlson’s Fraternity imprint was Cincy’s second-biggest label in 1962, when producer Carl Edmondson offered to produce Mack’s debut single. "I was playing around town and knew everybody. He just said, ‘How would you like to go down and make a record?’" says Lonnie. "So we went down and talked to Harry. He wanted me to play ‘Memphis,’ which I did. And we recorded it." Though he often sang, Mack’s impeccable instrumental rendering of Chuck Berry’s Memphis turned out to be a Top Five pop smash during the summer of ’63. Wham!, an original instrumental chosen as Mack’s Fraternity encore, was even more explosive. With his tight band (saxists Irv Russotto and Marv Lieberman, keyboardist Truman Fields, bassist Wayne Bullock, and drummer Ron Grayson), Mack lit the fuse on Wham! and let it blow sky-high. Amazingly, it only made it to #24 pop that fall. Then Lonnie the vocalist stepped up on a revved-up revival of Jimmy Reed’s blues Baby, What’s Wrong that barely nicked the charts near year’s end. Its flip Where There’s A Will, an impassioned secularized treatment of a gospel number, almost got Mack an R&B hit until program directors like one he recalled in Birmingham actually met the burly white axeman. "It was number one on the black station," he says. "I went up to do an interview, and the guy took one look at me and said, ‘Hey baby, you’re the wrong color!’ He pulled my record off." 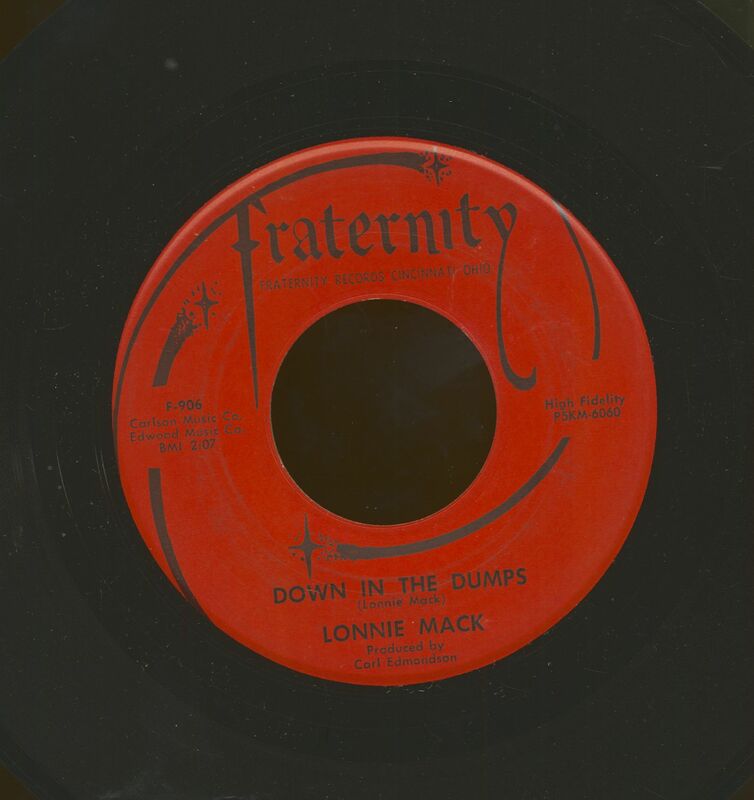 Chicken Pickin’, another astonishing Mack instrumental on Fraternity, failed to hit at all. Mack has run the gamut from country to rock to soul and back again since then. "When I did the first album way back in the ‘60s, I did ‘Memphis,’ and that sort of labeled me always," he says. "I’ve always tried to come through as a vocalist, but everybody kept trying to make me an instrumentalist." Customer evaluation for "Memphis b-w Down In The Dumps (7inch, 45rpm)"